This blog will centre on a conversation held after one of our workshops, rather than the workshop sessions themselves. After the session Lois and I tried to pin down what it is that we're doing in our work - it's an attempt that we make every so often. After all, we've been a team for 14 years, so surely we should have an inkling? But the thing defies us. 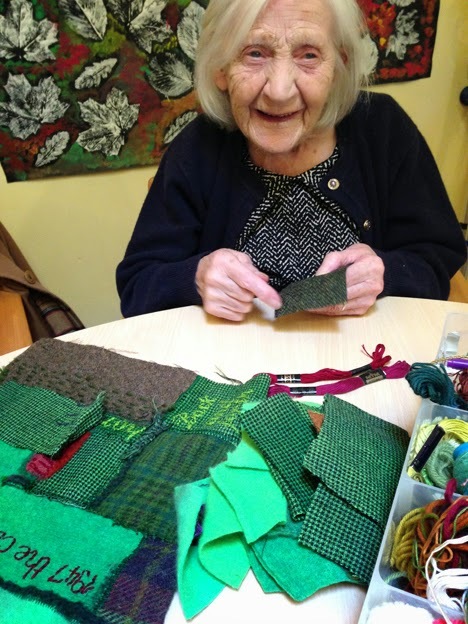 We aren't running reminiscence projects, because often we confront the present as well as the past. We aren't therapists because we investigate material with an eye on the art itself, rather than trying to make the art do something that isn't artistic. And yet as artist/writer we are collaborators, not originators - and some people would dispute that we are artists at all. We aren't oral historians because our attempt is not to construct any consensus on events, only to honour personal histories however eccentric or 'wrong' they might seem. We aren't journalists because we aren't wedded to the big matters of the moment. So what are we? Ezra Pound famously described poetry as 'news that stays news'. It doesn't date because it locates itself in the deeper currents of living, inner worlds, and sidesteps the quick judgement and the glossed exterior. Perhaps there is some of this in what we are trying for: to make work that speaks beyond it's own time, because it is at heart the story of how life FEELS, not what it is supposed to be.